I recently discovered the company “Heartfelt Creations” (www.heartfeltcreations.us) and some of their gorgeous dies. 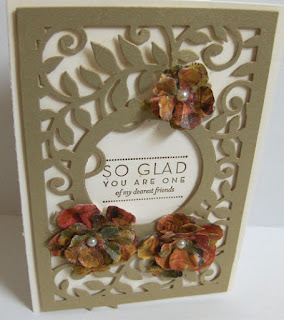 This is the first card I’ve made with one of their dies and I absolutely LOVE it! Isn’t it beautiful? I used “brushed gold” cardstock to cut the die and focused in on the saying . . . one of my favorites, as I reflect on the amazing blessing of friendship . . . such a special gift from God! Happy Tuesday . . . do something creative today! Enjoy God’s gift of creativity, too!